Rafa Nadal ran his 2013 record on hardcourts to 16-0 by steamrolling American Ryan Harrison in his first-round match at the U.S. Open on Monday but would not say he was playing his best tennis ever on concrete. The second-seeded Spaniard came to Flushing Meadows off successive hardcourt tournament wins in Cincinnati and Montreal and has lost only three matches on all surfaces this year. Nadal asked rhetorically if he was playing better than when he won the 2008 Beijing Olympics on a hardcourt, or when he won the 2010 U.S. Open to complete his career grand slam. "It is difficult to analyze now," said Nadal, who was once considered a clay court specialist. "We go day to day." Just arriving at Opening Day at the U.S. Open felt like a triumph for Nadal, who had missed last year's championship with a knee injury that also ruled him out of the Australian Open in January. "Today is the first match after two years in Arthur Ashe, so is a great feeling," said the Spaniard, who moved fast and freely, and flashed the ferocious power of his groundstrokes that has helped carry him to 12 grand slam titles. Nadal served brilliantly despite swirling winds blowing across the centre court. He pounded in 72 percent of his first serves took advantage of second serves from the American, winning 71 percent of them. The 21-year-old Harrison, ranked 97th and considered one of the best hopes among upcoming U.S. men, appreciated the one-to-one tutorial he received from the Spaniard. "These top guys are really, really good at peaking at the slams," said wild card Harrison. "They know how to get their best out of it. It's almost like an Olympic sprinter who waits to try to peak at the right time, which is the Olympics once every four years. "The top guys have that mentality and know their routines. Even though he wins Cincinnati and Canada, he's thinking about peaking here, which he's going to have a really good chance because he's one of the greatest players ever." 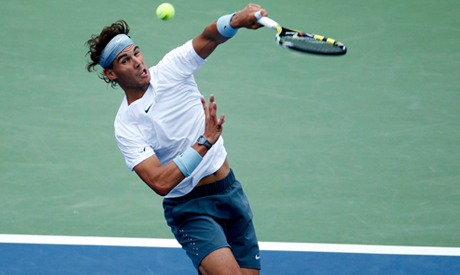 Nadal, a fiercely intense competitor, said his key to staying fresh was keeping to a routine. "At the end of the day, all the small things can help if you don't get crazy. I always had the theory that most important thing is be happy, enjoy what are you doing, and be fresh mentally," he said. "Everything very normal, nothing strange in my life. I practice. I practice physical performance, practice tennis. I go fishing. I play golf. I go party when I have the chance to go party. That's all." All that combined with the Spaniard's fierce pride, freakish athletic ability and obsessive attention to details and a variety of superstitions. "Really normal guy, normal life," Nadal said.